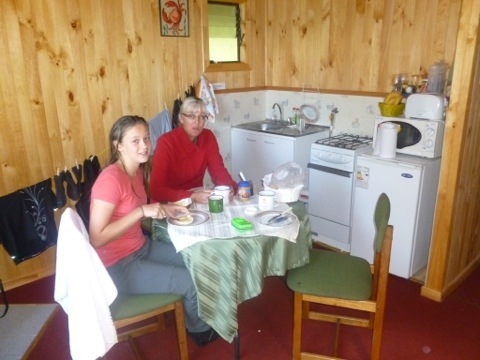 We are nearly at the end of our time in Chile. 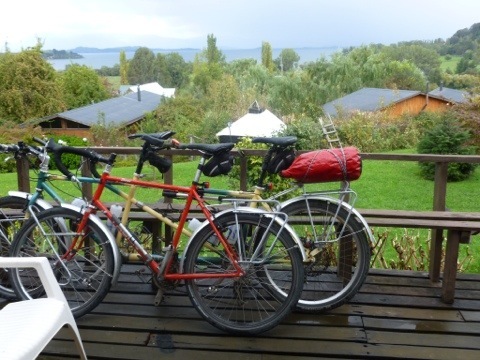 Today I am packing up the bikes into boxes to transport them by bus to Santiago and then on Monday we fly out to Madrid. The last week or so has been very pleasant if not quite as stunning as the preceding few months. 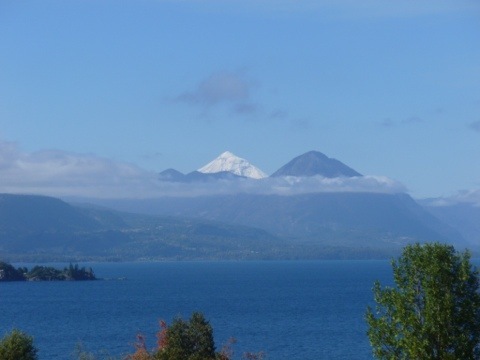 We have worked our way further north through the Chilean lake district, all the time with volcanos looking over us. 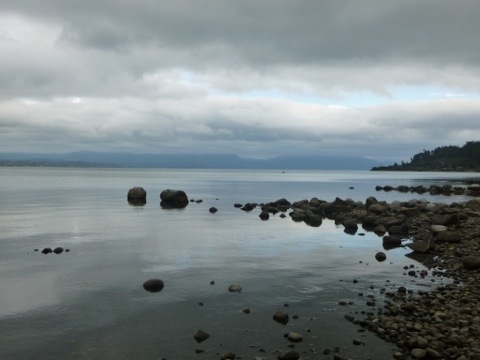 Our predicted bad weather wasn’t nearly as bad as expected, but we waited out the worst of it firstly in a cabin overlooking Lago Puyehue and later spending a couple of days in a cabin overlooking Lago Ranco. 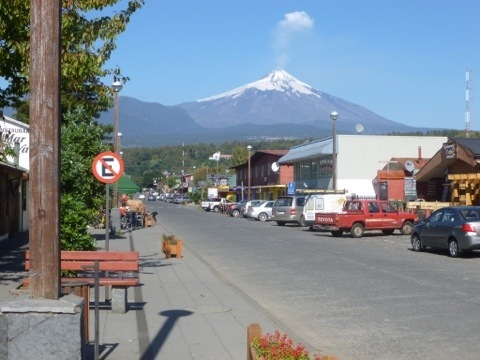 Unfortunately, we didn’t manage to glimpse any smoke out of the recently erupting Puyehue volcano due to cloudy conditions. Most of the cycling has been through flattish farmlands. I say “flattish”, since from a landscape perspective, we have mostly not been surrounded by huge mountains, but from a cyclists point of view, the roads have had plenty of ups and downs. 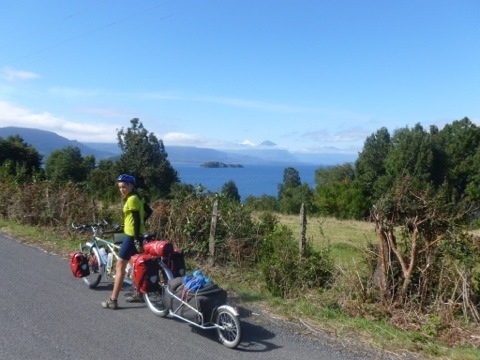 We have also mostly been cycling on tarmac, which has been great albeit with more traffic and still as many roadworks. We were forced to cycle through sticky tar at one point so the bikes are covered in black spots. 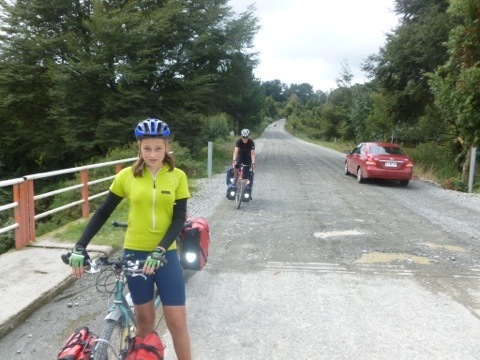 We also completed our last stretch of ripio (gravel roads) – a very sentimental moment. 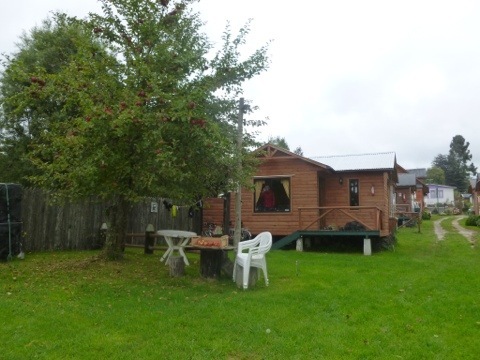 The good weather soon returned, so we were back to camping. 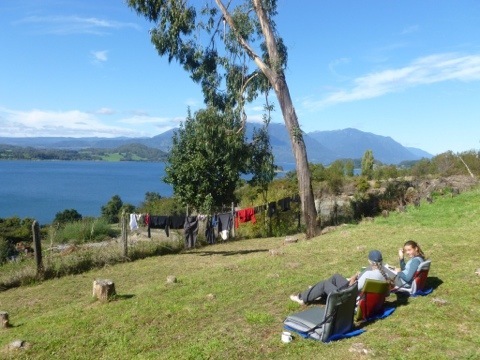 Yet another nice spot at Panguipulli with a completely empty campground. 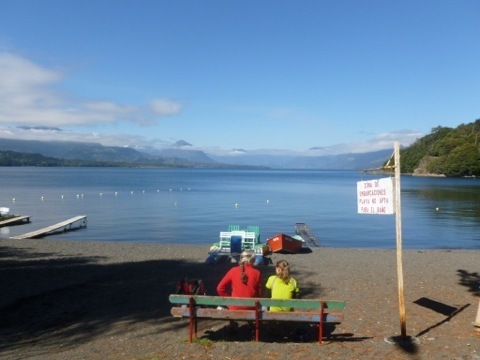 Finally, we did a last big 90km day to Pucón via Lican Ray – a completely empty tourist town on the Calquen lake. The views were incredible and it would be very a lively place in season. 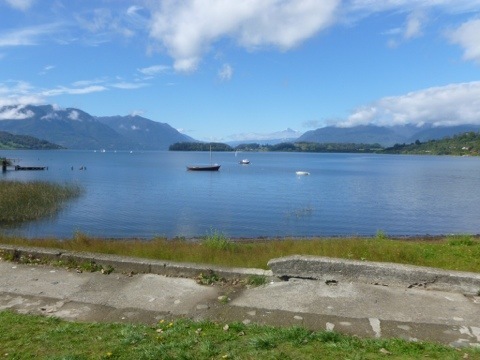 Pucon is an adventure playground for thrill-seeking tourists with skiing, rafting, kayaking, dog sledding, bungy and heaps more. 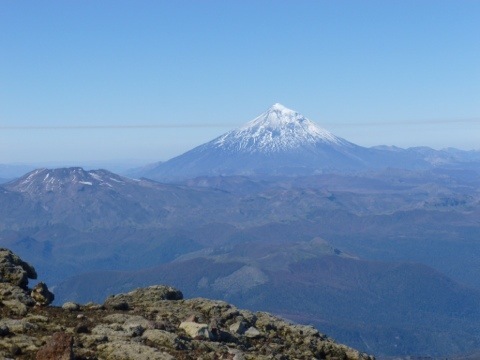 It sits beneath the imposing Villarica volcano. 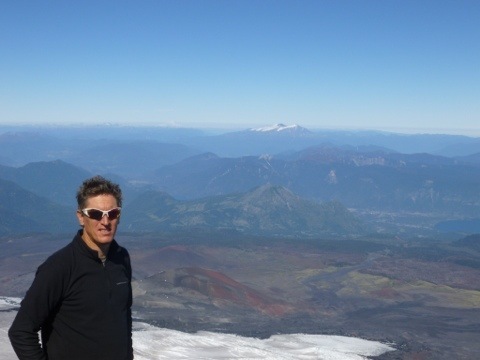 Poppy and I decided to get into the spirit of the place with a final fling in Chile – climbing the Villarrica volcano. 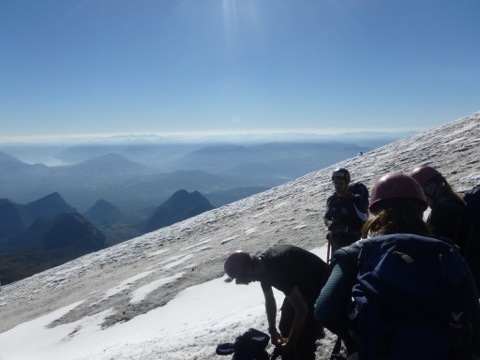 We took an organised trek with a group of about 15 others and 5 guides. It was a big day out – starting well before dawn in order reach the start of the walk from the ski station at first light. 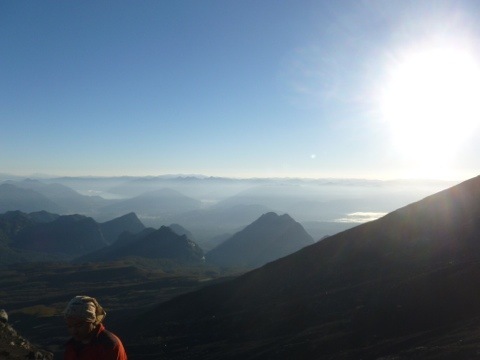 As we approached the base of volcano we could see smoke at the top reflecting an orange glow from the crater. 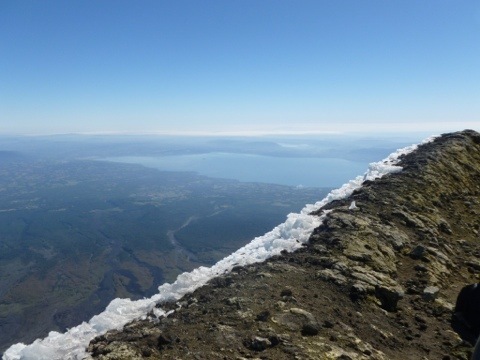 We took a chair lift to 1800 metres and then trekked to the summit at 2800 metres through both volcanic rock and ice. 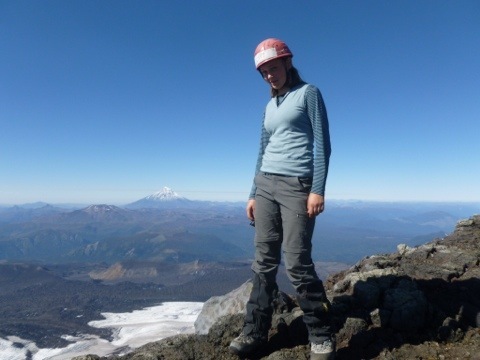 We were provided with boots, hard hat, crampons and ice pick in order to make it to the summit. 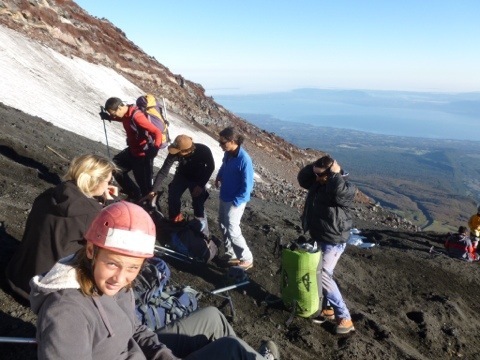 Some parts were a bit scary – particularly passing a chairlift station destroyed by eruption and stepping over a small crevasse. 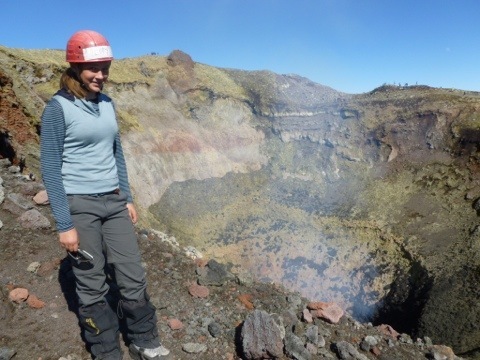 The views all the way were incredible and the noise coming from the crater was scary – truly sounding and feeling like a gently snoring monster. 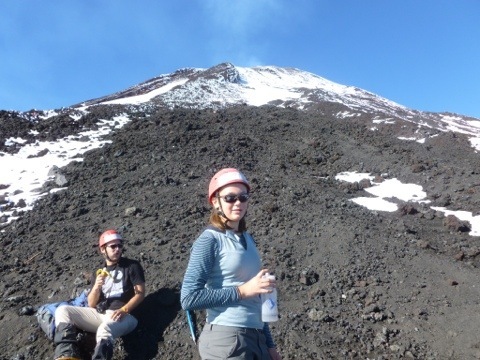 We had an hour on the top to complete a circuit of the crater before descending. 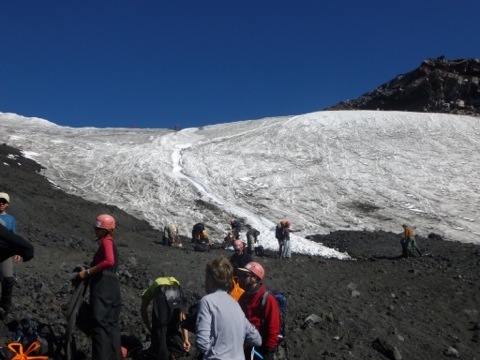 We slid our way down through the snow and ice sections via little toboggan runs before walking the final part of the descent on loose volcanic rubble. It was an incredible day and a great way to finish our Chilean experience.